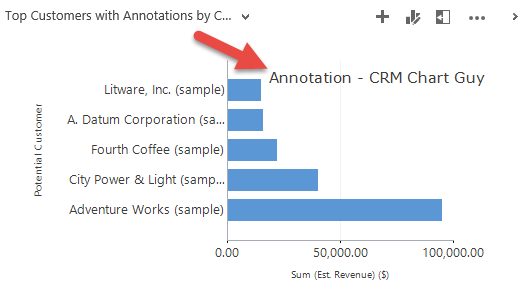 It might be a well-hidden secret, but it is actually fairly easy to add extra comments or annotations to your charts in MS Dynamics CRM. This could be for extra descriptions or guidance on how to interpret the chart. Here is an example of a chart with an annotation added. This example is simple, but the annotation can be customized with different fonts, sizes, positioning, have a tool-tip, etc. Before moving on, I would highlight that a well-designed chart should not need any additional explanation ever. However, no rule without exceptions, so if you do need to add annotations to your chart, here’s how it is done. Take any chart you want to add the annotation to, export the chart xml and add this piece of code towards the bottom between the </Legends> and </Chart> tags. If you copy the code below, only include <Annotations> through </Annotations>. The coordinates, X=”50″ and Y=”0″, sets the position of the annotation. They are percentages with 0,0 in the upper left corner and 100,100 in the bottom right. 50,50 would be right in the middle. In this sample I used x 50 and Y 0 to put the chart annotation centered on top. Text is what you want the annotation to say. TextStyle I have set to Default, but the options are Default, Embed, Emboss, Frame and Shadow. Font=”Verdana, 15px” is the font type and size. Here is a good list of fonts if you want to switch it. ForeColor sets the color of the font. See my previous post on colors in CRM charts for details. Finally, you can add a tool-tip if you want to elaborate further. While annotations can be helpful in some cases, they unfortunately do not support keywords or any other dynamically inserted data. This means, for example, that you cannot add a total, average, or other keywords in the annotation. I need to build a chart showing a list of top 10 open opportunities by estimated revenue. Simple enough except the fact that I need to also show the ‘sum total’ of all the est. revenue as well. how can I do that? Is it even possible OOB or using any of the above export XML hack? Not 100% sure if that is possible. However. first I would make sure to not use the Top 10 feature in the chart editor. Rather sort the chart and then adjust the axis (in the xml) to only show the 10 highest values. The difference is that the chart editor’s “top feature” excludes the rest of the opportunities from the fetch. You will need them all in order to calculate a total, which you will like have to do in a different series. Hope I am giving you enough to move forward. As I am writing through this though, I would be surprised if it wasn’t possible to do it. is it possible to do so using xml? This article has been added new information for me. I need to translate that annotation message as per user settings. I checked into Translation. But message not found. Is there any way to do so? No, the annotation is outside of the language settings. Depending on how many languages you have, you could have different charts for each language and then use a Model Driven App for each language. Kind of a long way around, but if you are doing it anyway for other reasons, then it may make sense.